Memorial Day is set aside to remember and respect those who died while serving our country in the United States armed forces. We'll attend our town's small parade, but mostly, it will be a quiet day at home. With strawberries just ripening now, I made this red, white, and blue fruit salad to eat with our dinner. Big Sister (age 8) immediately took note of the colors and knew it was to remind of us Memorial Day. 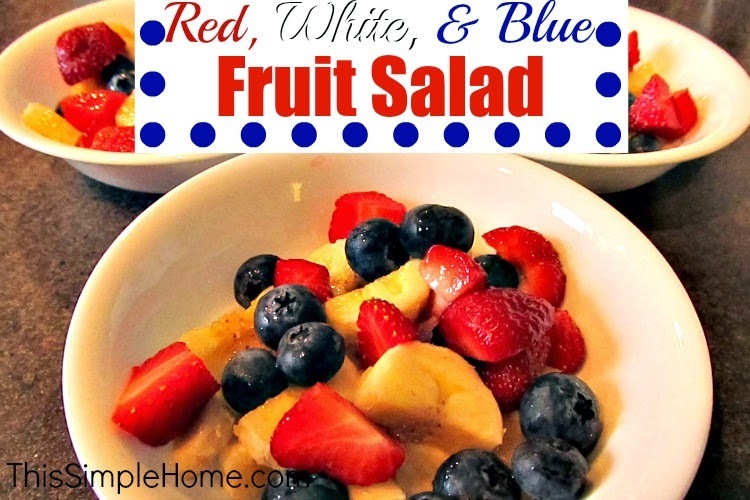 The patriotic fruit salad is made simply of blueberries, bananas, and strawberries. I've made this many times before and have substituted mini-marshmallows for bananas. Use this patriotic snack for Veteran's Day, Independence Day, Memorial Day, and the Olymics. If you are looking for a simple, yet decorative idea for a mantle or table, check out my red, white, and blue apothecary jar. Such a yummy combo! I like this with some toasted pecans thrown in, yum! Oh yummy! With summer coming I crave fruit! Thanks for this. Now I know what I am having for breakfast! Why is it that I have had fruit in my fridge for 2 days now and I don't want it. But YOU post that delicious picture and now I am craving it? LOL Looks so good Annette! I definitely need to bookmark this post. I'm starting a diet soon and I'll need healthier snacks to chomp on. I have an issue with buying fruit and it going bad before I can eat it all, but this might help with that! !